Chimpanzee Tea Party: I Win Teh Internetz!?!? Impressive, eh? 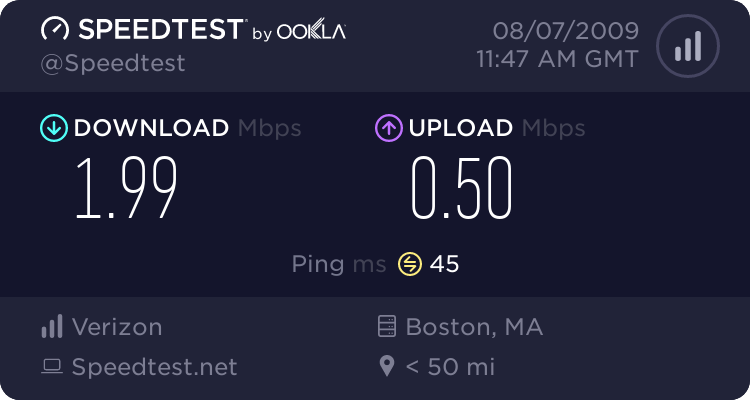 Assuming the cable guy comes as scheduled, and no unexpected problems arise, today should be the last day of my swizzle stick like connection to the intertubes... so I did a bandwidth test at Speedtest.net for comparison's sake. We're going with the "Ultra" internet option from Comcast, which is one step down from the top... and allegedly a 22 Mbps download and 5 Mbps upload... so more than 10x what we're currently getting. So I assume our connection won't choke when I want to play Blood Bowl while Anna's playing WoW. Sigh. It's fairly expensive(roughly $60 per month I believe), but somewhat incredibly, only a couple bucks more per month (with local phone service) than we were paying with Verizon for DSL+local. That's presumably because I was being penalized for not having some sort of package, but regardless, it's not going to effect our monthly bill, despite the huge speed upgrade and the switch to a (fingers crossed) non crackly telephone. You'd think, with the internet being my primary form of entertainment, that I'd have made this switch ages ago. But when we moved into our current place, there weren't any of these uber high speed options available... Cable was faster than DSL, but only marginally so, and I still wanted a landline but didn't want television service. So back then I was forced to either pay for cable TV I didn't want or be heavily penalized for just getting internet service(still the case, but now you can do phone instead of TV)... while still paying Verizon for a landline. So with my cellphone on Verizon as well, it seemed to make sense to keep it all on one bill. As the high speed cable options came online, I was of course intrigued, but figured I could just wait for FiOS... after all, we don't do a lot of downloading... mainly WoW and streaming video from Hulu and Netflix, and DSL seemed sufficient. However, ever since Xbox teamed with Netflix, allowing LIVE users to access the online movies, that service has been nearly unusable for us... and not being able to play online games at the same time? That was the nail in the coffin. I'll test the speed and update from the shiny new modem(one downside of doing telephone instead or TV as your package is that you can't buy your own modem but have to lease one for $3 a month) as soon as I get it running. Then I'll get the added joy of calling up Verizon to cancel my DSL service.